Ian Scott Anderson, MBE (b. 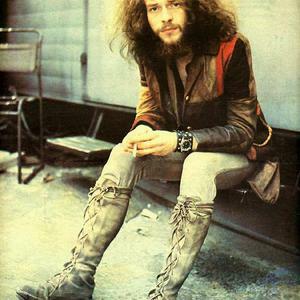 1947) is a Scottish singer, songwriter, and multi-instrumentalist, best known for his work as the leader and flautist of British rock band Jethro Tull. Anderson was born on 10th August 1947, the youngest of three children. He spent the first part of his childhood in Edinburgh, Scotland. He was influenced by his father's big band and jazz records and the emergence of rock music, though disenchanted with the "show biz" style of early American rock and roll stars like Elvis Presley. Anderson was born on 10th August 1947, the youngest of three children. He spent the first part of his childhood in Edinburgh, Scotland. He was influenced by his father's big band and jazz records and the emergence of rock music, though disenchanted with the "show biz" style of early American rock and roll stars like Elvis Presley. His family moved to Blackpool, Lancashire in 1959, where he gained a traditional education at Blackpool Grammar School. He went on to study fine art at Blackpool College of Art from 1964 to 1966. In 1963, he formed The Blades with school friends Barriemore Barlow (drums), John Evan (keyboards), Jeffrey Hammond (bass), and Michael Stephens (guitar). This was a soul and blues band, with Anderson on vocals and harmonica. At this time Anderson abandoned his ambition to play electric guitar, allegedly because he felt he would never be "as good as Eric Clapton". He traded his electric guitar in for a flute which, after some weeks of practice, he found he could play fairly well in a rock and blues style. He continued to play acoustic guitar, using it as a melodic as well as rhythmic instrument. As his career progressed, he added soprano saxophone, mandolin, keyboards, and other instruments to his arsenal. His famous tendency to stand on one leg while playing the flute came about by accident. As related in the "Isle of Wight" video, he had been inclined to stand on one leg while playing the harmonica, holding the microphone stand for balance. During the long stint at the Marquee Club, a journalist described him, wrongly, as standing on one leg to play the flute. He decided to live up to the reputation, albeit with some difficulty. His early attempts are visible in The Rolling Stones Rock and Roll Circus film appearance of Jethro Tull. In later life he was surprised to learn of iconic portrayals of various flute playing divinities, particularly Krishna and Kokopelli, which show them standing on one leg. While Anderson has recorded a small number of critically acclaimed projects under his own name, and frequently makes guest appearances in other artists' work, he has been identified in the public eye as the frontman of Jethro Tull for forty-four years. This is undoubtedly because a signature motif of Anderson's career has been a highly distinctive stage image, which has often been counter to the prevailing rock music culture. While he has habitually drawn inspiration from British folklore ? at different times deploying stylistic elements of medi?val jester, Elizabethan minstrel, English country squire and Scottish laird ? at other times he has appeared as astronaut, biker, pirate, and vagrant. His personae often involve a large degree of self-parody. As a flautist, Anderson is self-taught; his style, which often includes a good deal of flutter tonguing and occasionally singing or humming (or even snorting) while playing, was influenced by Rahsaan Roland Kirk. In 2003 he recorded a composition called Griminelli's Lament in honour of his friend, the Italian flautist Andrea Griminelli. In the 1990s he began working with simple bamboo flutes. He uses techniques such as over-blowing and hole-shading to produce note-slurring and other expressive techniques on this otherwise simple instrument. He has recorded several songs on which he plays all the instruments as well as carrying out all the engineering and production (such as 1988's "Another Christmas Song"). Anderson's music blends styles such as folk, jazz, blues, rock, and pop. His lyrics are frequently complex, (mostly) tongue-in-cheek criticism of the absurd rules of society and/or religion ("Sossity, You're a Woman"; "Hymn 43"; "Thick as a Brick"). He often combines lyrics with other leitmotifs such as folk, mythological, fantastic ("The Minstrel in the Gallery", "Jack-in-the-Green", "Broadsword and the Beast"). In the 1990s and 2000s, Anderson's songs often capture 'snapshots' of his daily life ("Old Black Cat", "Rocks on the Road").